Train station and two of seven elevators that stood in Sexsmith. Sexsmith is a town in northern Alberta, Canada. It is located on Highway 2, 20 kilometres (12 mi) north of the City of Grande Prairie. Sexsmith is located in the Peace River Country region of Alberta, one of the most fertile growing areas in the province. 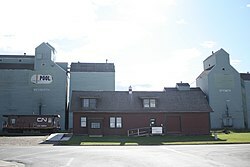 The town was once known as the "grain capital of the British Empire": In a 10-year period from 1939 to 1949, it shipped more grain than any other port in the empire. In the 2016 Census of Population conducted by Statistics Canada, the Town of Sexsmith recorded a population of 2,620 living in 873 of its 937 total private dwellings, a change of 8.4% from its 2011 population of 2,418. With a land area of 13.24 km2 (5.11 sq mi), it had a population density of 197.885197.9/km2 (512.520512.5/sq mi) in 2016. In the 2011 Census, the Town of Sexsmith had a population of 2,418 living in 807 of its 848 total dwellings, a change of 22.8% from its 2006 adjusted population of 1,969. With a land area of 13.43 km2 (5.19 sq mi), it had a population density of 180.045180.0/km2 (466.314466.3/sq mi) in 2011. The population of the Town of Sexsmith according to its 2007 municipal census was 2,255. Below is a summary of Sexsmith's population growth since 1996. Encana owns an oil and natural gas liquid processing plant with a total capacity of 115,000 barrels per day, from wells drilled into the Montney Formation. ^ "Location and History Profile: Town of Sexsmith" (PDF). Alberta Municipal Affairs. October 7, 2016. p. 555. Retrieved October 13, 2016. ^ Statistics Canada. "Canada 2006 Census: Sexsmith - Community Profile". Retrieved 2007-06-12. ^ a b Statistics Canada (2007-02-01). "2001 Community Profiles – Sexsmith (Town)". Retrieved 2010-09-08. ^ "Encana Corporation (ECA.TO)". Reuters. n.d. Retrieved 23 January 2015. This page was last edited on 23 December 2018, at 18:19 (UTC).